# DIXRAM2 - Air King Universal Couplings - Male NPT Ends - Stainless Steel - 1/2 in. Prices for Universal Couplings listed above include safety clip. The use of an "Air King" Safety Clip or wire type retainer is necessary to assure "Air King" Universal Couplings will not become accidentally disconnected. 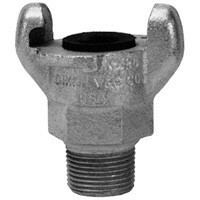 This guarantees the fittings are properly connected as pin will not go through holes in mating flanges until couplings are locked in place. Only one "Air King" Safety Clip or wire type retainer is required for each "Air King" Universal Coupling. Made in the U.S.A. "Air King" is rated to 110 PSI. Standard "Air King" fittings come with AWR4 washers. "Air King" available to meet MIL Spec. WWC-633D - consult factory.